Your wand has been designed to be simple and elegant and ready to be personalised by you. There are loose cords waiting for you to add your own touches like feathers or bells, if desired. Your name can be inscribed with Runes or other personal symbols. Every wand is totally unique. Only one wand is made from any one branch. When your wand chooses you, you can be assured of a magical partnership. This Quartz wand is made of Willow and is crowned with a Clear Quartz Point, finished with an golden star at the base. The colour chosen for your wand’s cord is Gold, entwined is the colour of luck and success. Quartz produces a naturally balanced energy field, which can be used to amplify both energy and thoughts. The natural tendency of this stone is towards harmony and it is recognised as a stone of power. It is useful for meditation and getting in touch with ones higher self. Willow is associated with the moon and water, it puts us in touch with our feelings, deep emotions and helps us to express them. Although this is a slender wand, don’t be fooled by its size. The combination of Quartz and Willow will provide a potent magical mix. If desired I can inscribe your name in Runes or other personal symbols on your wand. Every wand is totally unique with only one wand made from any one branch. When your wand chooses you, you can be assured of a magical partnership. Comes with the relevant Scroll fully detailing the magickal properties of your wand. Each wand comes with its own velvet bag. This Citrine wand is made of Birch and is crowned with a tumbled Citrine, finished with another smaller tumbled Citrine at the base. The colour chosen for your wand’s cord is Gold, entwined is the colour of luck and success. Citrine is an energising stone against power issues of will-power, optimism, confidence and self-discipline. Healers consider Citrine a self-esteem stone with the powers to heal the minds feelings of inadequacy and brings clarity to the mind. As the 'stone of family' it is said to bring harmony to the home. The Birch is a very lucky tree and is a sign of general good fortune. Birch has to do with new beginnings, inception or birth of things or people. The energizing or revitalizing effect of this power provides for the protective aspect of the Birch. It has the power to “drive out” evil or corrupting influences by means of its eternally vital life-force. Although this is a slender wand, don’t be fooled by its size. The combination of Quartz and Birch will provide a potent magical mix. If desired I can inscribe your name in Runes or other personal symbols on your wand. Every wand is totally unique with only one wand made from any one branch. When your wand chooses you, you can be assured of a magical partnership. 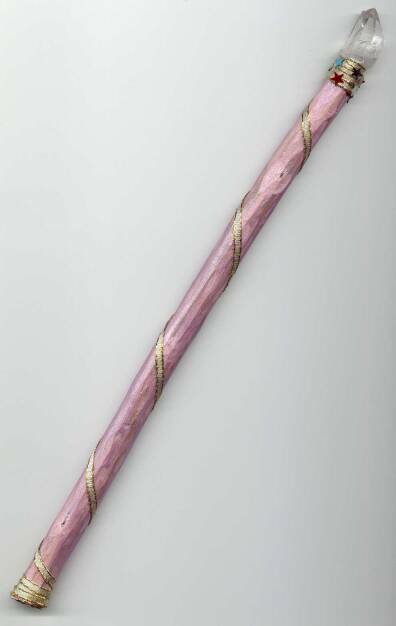 The Wand of Transformation is made of Birch and is crowned with a Yellow Jasper single terminated point, finished with a Purple Fluorite crystal from Mexico. The colour chosen for your wand’s cord is black, the colour of transformation and the banishment of negativity. It is also the colour of beginnings and endings. The elements of this wand have been attuned towards the East and the third eye chakra; towards dispelling negativity and allowing a working through changes by aligning the physical, mental and magical aspects of Self. The birch is a very lucky tree and is a sign of general good fortune. Birch has to do with new beginnings, inception or birth of things or people. The energizing or revitalizing effect of this power provides for the protective aspect of the birch. It has the power to “drive out” evil or corrupting influences by means of its eternally vital life-force. The Psychic Healer Wand is made of Birch and crowned with a Chlorite-Phantom Quartz crystal and finished with an Australian Chrysoprase. The colour chosen for your wand is Green, the colour of abundance and new opportunity, as well as healing on all levels. The Chlorite Phantom is said to protect against psychic attack and also remove undesirable energy and Chrysoprase can help you to achieve greater personal insight. Its calming and shielding energies can help you work through issues. The birch is a very lucky tree and is a sign of general good fortune. Birch has to do with new beginnings, inception or birth of things or people. The energizing or revitalizing effect of this power provides for the protective aspect of the birch. It has the power to “drive out” evil or corrupting influences by means of its eternally vital life-force. 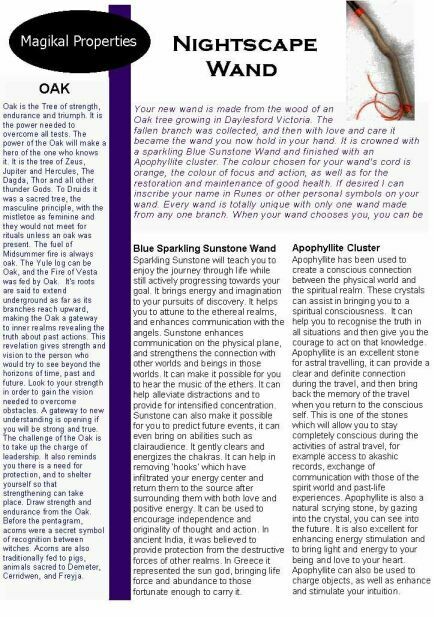 The Wand of Intuition is made of Oak and crowned with a Moonstone and finished with an Amethyst. The colour chosen for your wand’s cord is Purple, the colour of perception, transformation and intuition. The Oak is a tree whose roots are said to extend underground as far as its branches reach upward, making the Oak a gateway to inner realms revealing the truth about past actions. Moonstone's energies are feminine in nature. They can help us all become more sensitive and loving. Amethyst works to build your intuition. It will not only encourage the opening of intuition, but will also allow the possibility of change. Amethyst is said to protect against ‘psychic attack’. It takes negative energy & transforms it into positive, loving energy. 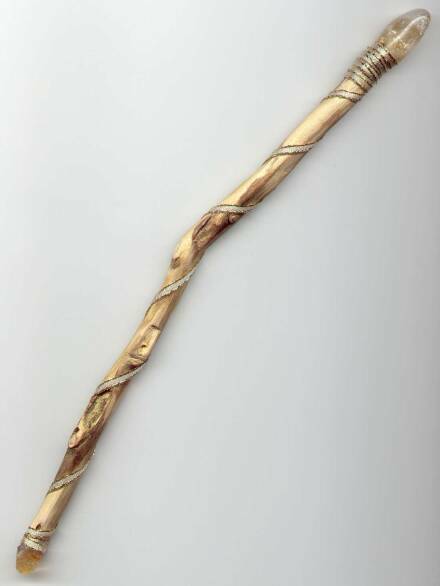 The Wand of Wisdom is made of Oak. It is crowned with an uncut and completely natural, clear Quartz Channeling/Time Line crystal and finished with a natural Garnet. The colour chosen for your wand’s cord is Yellow, the colour of Air and wisdom. The Oak is a tree whose roots are said to extend underground as far as its branches reach upward, making the Oak a gateway to inner realms revealing the truth about past actions. Quartz produces a naturally balanced energy field, which can be used to amplify both energy and thoughts. Time Line Crystals are said to access information from the past and future. Channeling Crystals can be used for obtaining information from deep within yourself or from sources that are outside of your normal realm. Garnet acts as a source of light and guidance for the paths, both physical and metaphysical, for travelers and those that feel they could use some direction. Not only has it been known to guide, it also can provide enlightenment, creative inspiration and positive energy.